This is my one year anniversary of participating in Foodie Pen Pals. Shania, who lived in New Jersey, sent me my first box. I remember worrying about her last October because she was in the path of Superstorm Sandy. Luckily she was fine. She sent me magnets which is funny because Katie, my partner this month, also sent me magnets. This time I sent to and received from Katie who lives close to Chicago. For information about what I sent her, please visit her blog. Spicy Moroccan Sauce – Haven’t decided what to make with it just yet. The place it’s manufactured is actually 45 minutes from me. I keep almonds in my desk drawer at work to eat for energy. I actually ate them the night I got these. Yummy! Happy Halloween! This week is another crazy week! I’m going to be cooking dinner this week though. The boys are in Cub Scouts. We had their annual Halloween party last Thursday. Someone made this boo mix for some of the snacks being served. Oh, my goodness, I could not stop eating it. I even took one of the last two cups of it and ate some on the way home and the remainder the next day. I did not let any be wasted. 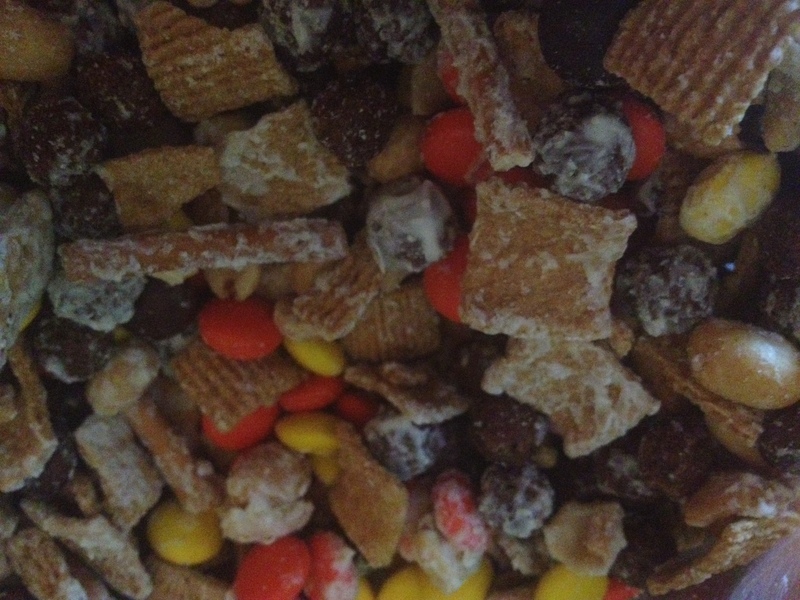 Today I found the recipe so I decided to make some of the snack mix for the boys and my lunches. Both boys tried some after I made it. They both loved it so each of them has 5 snack size bags of the mix for their lunches. Then our friend stopped by the house and tried it. He also gave it a thumbs up! Place the white chocolate in a glass microwaveable bowl. Melt following the directions on the bag. 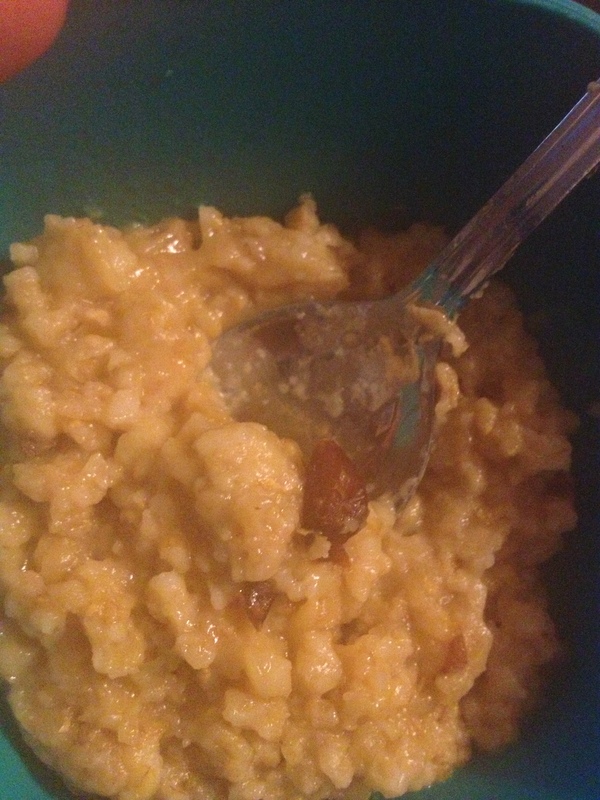 Pour the cereal mixture. (I did a little bit of it at a time.) Stir until everything is coated. Spread out onto waxed paper, parchment, or foil. Let sit until completely dry and break into clumps. This week’s a strange week. I’ve only got to cook dinner 3 times this week – Monday, Tuesday, and Thursday. So my method for planning those 3 days is this: Go to my freezer. Open it up. What do I have that I need to eat up or cook up. So it’s no real plan for this week. My husband loves getting food from the Chinese food restaurants in our local mall’s food court. So I decided to recreate one of the dishes he might purchase there. This dish was healthier than what you get at the food court. When it was cooking in the oven, he thought it was a sweet and sour dish. So he was super excited for dinner last night. The only issue with the dinner was super lemony but it’s an easy fix. If you really love a lemon flavor, add the lemon zest and additional lemon juice. In a bowl big enough to dredge the chicken in, place the lemon juice. In another bowl big enough to dredge the chicken in, place the bread crumbs or panko. First dredge the chicken in lemon juice and then dredge the chicken in the bread crumbs or panko. Place in the cooking dish. Continue with the remainder of the chicken pieces. If you want it really lemony, top with more lemon juice and lemon zest. That is I’ll eat it if I’m hungry. I also have either a small handful of almonds or chocolate covered raisins between groups of students. Now the question is, what should I dip into this yumminess! I’ve been dipping chocolate cat cookies from Trader Joe’s. Tomorrow I’m going to try dipping my sliced apples in the dip. That sounds absolutely divine. 1/4 c. nut butter of choice – I used almond butter. Add the ingredients except for chocolate chips and milk to a good food processor. Blend the ingredients – streaming into milk until desired considency. Remove from food processor cup. Mix in chocolate chips. Enjoy with apples, graham crackers, or just eat by the spoonful! Mmm! Comfort food makes you feel good inside. Pot roast is one of those foods. As I was coming up with this week’s menu, I decided pot roast should be one of our dinners. The interesting thing was we had pot roast for our dinner at my in-laws last night. The difference was how we prepared the roast. The side dishes were different also. I’ve made this recipe for over 10 years. It is super easy and delicious. After we have roast for dinner, another night during the week I make a hash (minus eggs) with the left over roast. Yum! Even though I like making baked potatoes cooked in the slow cooker, I’m not a fan of potatoes cooked with the roast. We had buttered noodles with our roast. Place roast into the bottom of the slow cooker. If placing vegetables, place them on top of the roast. Pour tomato sauce over the roast. Cook for 3 to 5 hours on high or 6 to 8 hours on low.